Guitarist issue 351 - on sale now! We sit down with the Smiths legend to get an exclusive and in-depth look at his brand new signature Fender Jaguar and the journey he went on to create it. PLUS! We sit down with Johnny, his tech Bill Puplett and designer John Moore to discuss what makes the Johnny Marr Signature Jaguar so different - have they finally 'fixed' this notoriously temperamental design? In the first of a new series examining the lives of the true founding fathers of modern guitar playing, we tell the story of electric jazz pioneer and one of the most influential players of them all, Charlie Christian. We pay tribute to Howlin' Wolf's legendary sideman, and a touchstone for so many blues guitar staples, who died in December last year. EVH 5150 III 50-watt head - a first look at Eddie Van Halen's brand new signature amp, with half the power and half the volume of the 100-watt version, could it be the club shredder's new best friend? 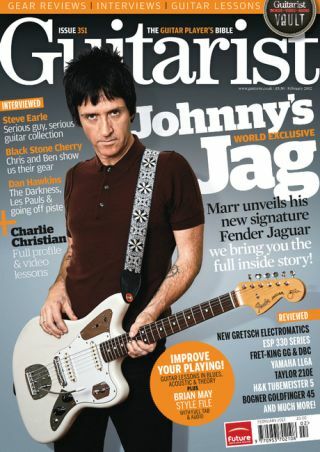 Guitarist issue 351, is available now from all good UK newsagents. Non-UK readers can purchase a copy from www.myfavouritemagazines.co.uk, or UK readers can subscribe and receive a free gift!